22 gauge Sterling Silver Sheet Metal - 6-inch wide, see chart below to order the correct number of troy ounces for the sheet length you wish to order. This item is dead soft. 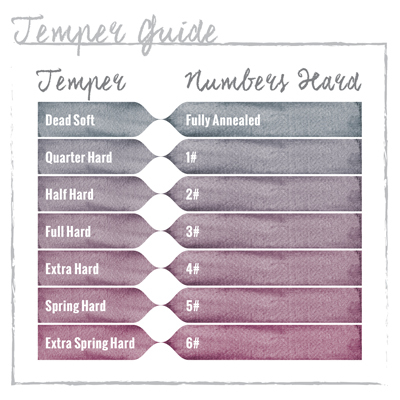 Scroll down further to see our complete temper chart guide. Dead soft 22 gauge sterling silver sheet is a workbench basic. Use it to create pendants, form the base of bezel cups and more. Visit our blog for more jewelry design ideas. Notes: 1x6in piece is .81 ounces, dead soft Use conversions below to order the correct number of troy ounces for the length of sheet you wish to order. I buy all my sterling sheet from Halstead. Love it. And the price / service. The product itself was fine, I was just disappointed that they could not fill my order as requested due to a lack of product on hand. I ordered this silver sheet to use in some of my jewelry designs. It arrived in perfect condition and just as expected. I really like using the 22 ga silver for my earring designs because it is easy to work with and a bit lighter for more comfortable earrings. I will buy this item again. I also would like to comment on the great service I received.